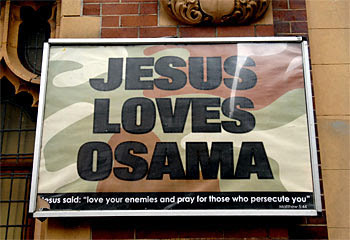 Posters outside various churches in Sydney and Melbourne this last week have excited all sorts of commentary about the accuracy or otherwise of the statement “Jesus Loves Osama”. It is unquestionably a provocative and even emotional statement, prodding our community fears about terrorism and needling our other insecurities. Is it a true statement? Much of the commentary has linked the love of Jesus with consequences. And there is plenty of commentary that links the love of Jesus with an approval of Osama’s actions. That is, the assumed reasoning is “if Jesus loves Osama then he must approve of what Osama has done”. We don’t feel that we could love Osama because of what he has (allegedly) done. Fair enough. Or perhaps our sense of justice is sharpened, and we want to see him stand trial for his (alleged) crimes. Fair enough too. There is nothing in the Bible that says those who break our civil laws should not be brought to justice. But that is not what this sign is about. This sign is broadcasting the remarkable nature and personality of Jesus. What is remarkable about this guy is that he loves first, despite what we have done. He certainly does not approve of any law breaking we have committed. That goes for me, you or Osama. Or Hitler or Pol Pot. Or Saddam. Or the person who steals fruit from the neighbour’s tree in the middle of the night. What he does do is say he will overlook those misdeeds if we ask him to. Simple really. So if I ask him to forgive me he will. And Osama has the same deal offered to him. Jesus’ love, expressed in part in his willingness to forgive us, comes first. Not because of anything we have done, or not done. But simply because this is who he is. It is his nature to love. Would he approve of what Osama has done? Of course not. Would he demand justice? He does! But would he forgive Osama and show his love to him if Osama asked for that. Of course. Just as he does for anyone else on this planet. That being the case, the sign is right on the mark.